Ricolino's Kranky are delicious chocolate covered corn flakes. This sweet treat is the perfect snack on the go, whether you're going to the movies or to just eat it at home. Kids will love them too, Ricolino's Kranky are a great snack for children's school lunches. Ingredients: sugar, corn flakes (corn flour, sugar, malt extract, wheat flour, salt, milk, vitamins and minerals, rosemary extract), hydrogenated palm oil, skim milk substitute, cocoa, corn starch, Arabic gum, talc, glazing agent, soy lecithin, polyglycerol polyricinoleate, artificial flavor, salt and sucralose. 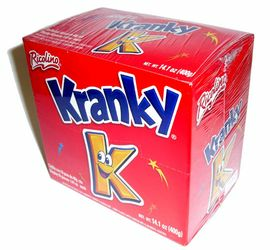 Ricolino's Kranky son hojuelas cubiertas con delicioso chocolate. Este dulce es perfecto como botana para el cine o para comerlo en casa. A los ni�os tambien les fascina, Ricolino's Kranky son una muy buena botana para acompa�ar el almuerzo de los ni�os. Ingredientes: azucar, hojuela de maiz (harina de maiz, azucar, extracto de malta, harina de trigo, sal yodatada, leche, vitaminas y minerales, extracto de romero), grasa de palmiste hidrogenado, sustituto de leche descremada, cocoa, almidon, goma arabiga, talco inerte, goma laca, lecitina de soya, poliglicerol polirricinoleato, saborizante artificial, sal yodatada y sucralosa. The item is a little over priced for my liking but the candy it's self is amazing I could eat it everyday that's if I would get cavities or gain weight. I highly recommend it to chocolate lovers. This is a tasty snack. It's affordable, chocolate, crunchy and easy to carry for when that craving arises. Cheap way to satisfy the urge to crunch and eat chocolate. Tasty snack and only $.59 ea at the Race Trac station (so $1.00 cheaper for a 10 ct. than on this site) and way worth it.